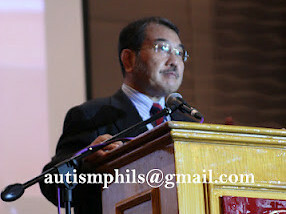 Autism Society Philippines (ASP) was so grateful to the ASEAN Autism Network (AAN) for supporting the 12th National Conference and the 2nd South East Asian Conference on Autism last April 28 and 29 at the Crowne Plaza in Quezon City participated by more than 400 delegates coming from the different parts of the Philippines and the ASEAN region. AAN delegates from Bangkok, Thailand was headed by Mr. Akiie Ninomiya, the Executive Director of the Asia Pacific Development Center on Disability (APCD) with Mr. Somchai Rungsilp, the International Training Manager. Mr. Ninomiya gave a very emotional and relevant message of solidarity not only as the Executive Director of APCD but as a father of an adult with Asperger Syndrome. 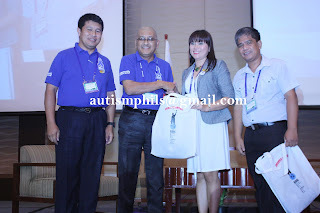 AU Thai or the Autism Society of Thailand was represented by two gentlemen Mr. Samreng Virachanang and Mr. Charoen Khuwinphunt. Mr. Samreng gave a message and shared about the road map of AAN in behalf of Mr. Chusak Janthayanond, the President of AU Thai and Chairman of AAN. The Royal Government of Thailand also supported the event through the National Office of Empowerment of Persons with Disabilities (NEP). The agency was represented by Ms. Phenpak Yayee and Ms. Prapavani Jaidi. Another AAN member, SMARTER Brunei also showed their support to ASP. It’s President Mr. Malai and Vice President Mr. Kamal together with their two Filpino teachers joined the conference. They were so happy to be back to the Philippines and were able to visit some special schools through the help of ASP. The visitors were impressed on how ASP organized the conference without the usual practice of having an event organizer to manage such big activity. They also notice the utilization of the volunteers and the presence of the different television stations to cover the event. Aside from attending the conference, the AAN delegates from APCD, AU Thai, SMARTER Brunei together with Executive Director Ranil Sorongon, ASP Immediate Past President Grace Adviento and the representatives of NEP had a meeting to initially plan the 2nd AAN General Assembly and Autism Congress to be hosted by SMARTER Brunei on May 2013.